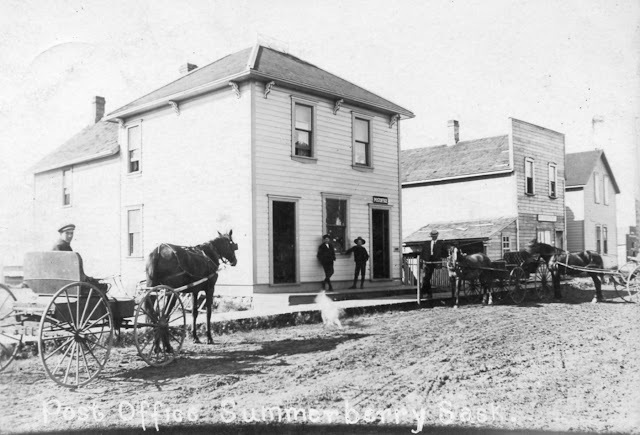 Summerberry Post Office, which opened in 1882. Date of the photo is unknown. 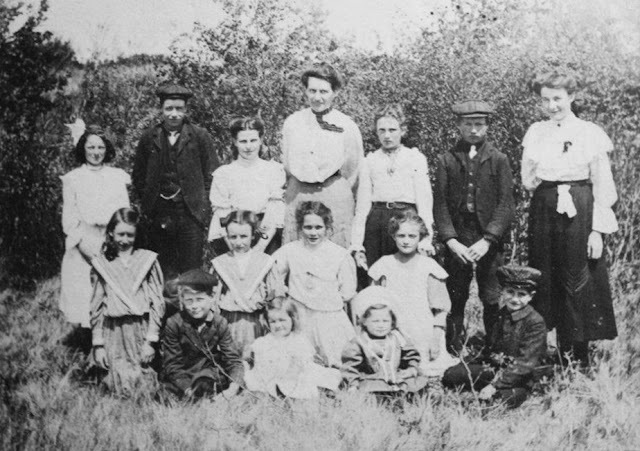 At that time, the eight children who were still at home ranged in age from 6 to 24. The younger children - Audrey, Ethel, Prue and Ryley - attended Weldon School, which was just north of their home and closer than the school in Summerberry. And no doubt like most farmers' kids, they each had their share of chores to do on the farm. At Weldon School in 1906 - In the back row are Ryley, age 15, 2nd from left and Prue, 13, far right. In the front row, Ethel, 9, far left and Audrey, 7, 3rd from left. 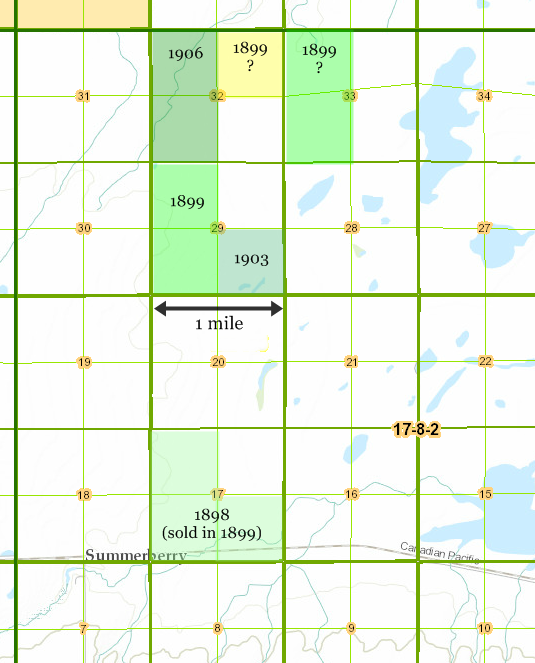 This section map shows what I think I know about what land George bought, and when. The CPR Land Sales records (1) show that he bought 3 quarters of section 17 in 1898, and sold them 18 months later. My cousin Donna apparently had documents showing that he bought five quarters in 1899 - the NE quarter of section 32 (I tend to think she was wrong about that, but I'm still waiting to find out), and the NW and SW quarters of both section 33 and section 29. A map in a local history book, 'Grit and Growth: The Story of Grenfell' (2) shows that he bought the SE quarter of section 29 in 1903. 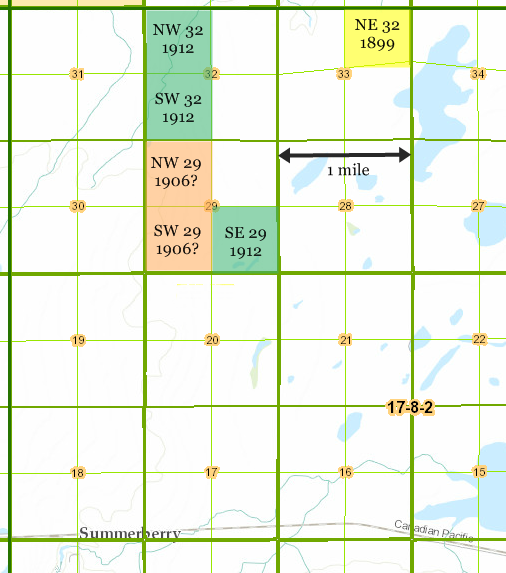 Donna said he bought the NW and SW quarters of section 32 in 1906. The 1906 census tells us that George owned fifteen horses, two cows, three other horned animals and ten hogs. Fifteen horses sounds like a lot to me, but most of his neighbours had around the same number. Farmers at that time needed a lot of 'horsepower' to work the land. If the above map is correct, George would have owned 1280 acres - so the horses would have been busy. 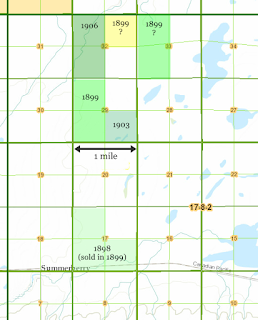 Having bought that much land, one would think George was planning to stay at Summerberry permanently, but in fact he only stayed for about a year and a half. 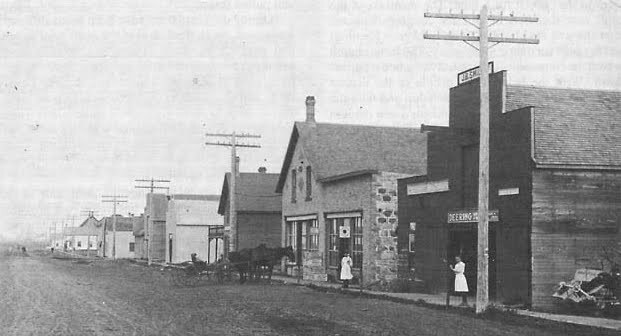 In November 1907, daughter Bessie Jane married John Stewart Fleming, who she had met in Indian Head, where he was the local blacksmith. They made their home in Indian Head. Only a month later, on Christmas day 1907, there was another wedding - second son Will married John Fleming's sister Janet (Aggie) Fleming. 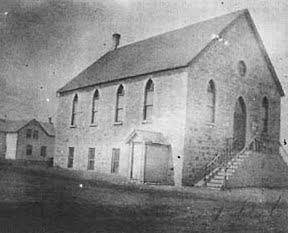 Will purchased the western half of section 33 from his father, and then, with six children still in tow, George and Louisa moved to Grand Coulee, where George had purchased an entire section of land (640 acres). which burned down in 1949. 1) Online at the Glenbow Museum, here. Search the CPR database for 17 17 8 W2. I didn't know how to interpret this information, but was advised by email from the Museum's Libray & Archives Director, that it means George bought the land, then sold it to James Geddes. Unfortunately the above two sources contradict each other about section 17. 3) As told by Prue and Audrey to my cousin Donna. Thanks, Anita. Many facts still elude me, but I try to stay on their trail!